Charentais type bred for northern climates so ripens in cooler weather. Good disease resistance. Round oval fruit with orange flesh. Compact bush so more suitable for small spaces. 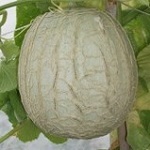 Cantaloupe with small, sweet, orange fleshed fruit.